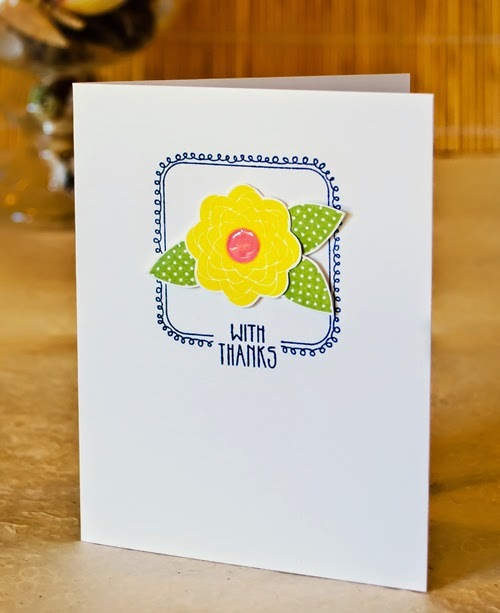 Love this Curly Label set from Clear and Simple Stamps -- makes a nice little background. MOOD WHEN DONE: No complaints! Very lovely. Saving to CASE sometime. Wonderful vivid colors, and the border (perfect contrasting color) really punches up the design. I like the Glossy Accents flower center -- gives the impression of dimension without being too much. Love that! Fabulously simple. Love the cheery color scheme. Karen summed up this card perfectly!! you are very sweet. thanks! Hey Joan B! what a fun card! that frame almost looks like you doodled it yourself! Great colors with the bright yellow bloom mixed with the blue and green!